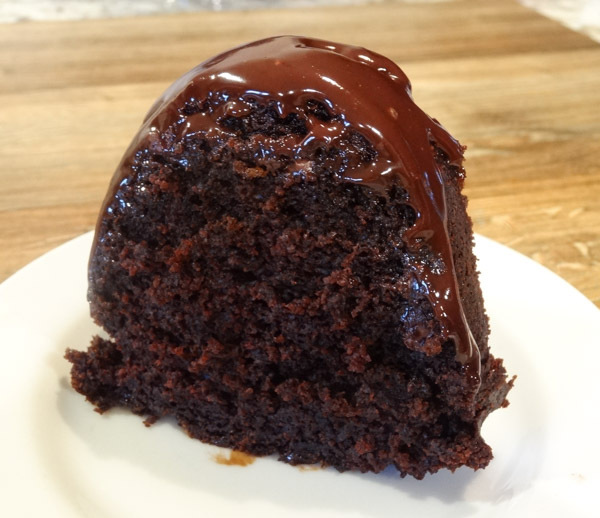 This Chocolate Bundt Cake is made from scratch. This is a moist and intensely chocolate cake topped with a semisweet chocolate ganache. A great dessert for chocolate lovers! 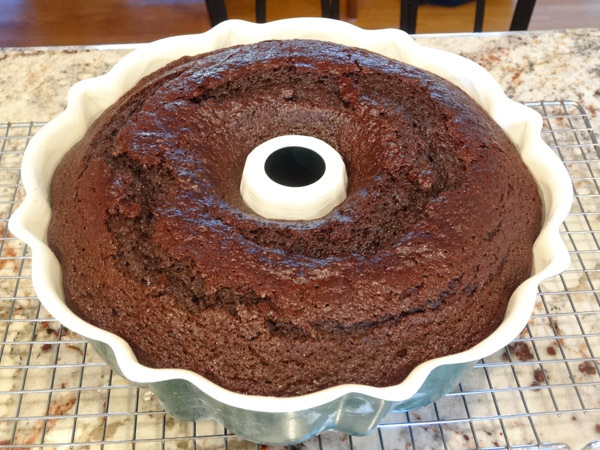 I’ve made several different versions of a chocolate bundt cake over the past month. Some have been from scratch. Some included a cake mix. I got my inspiration for this cake from Taste of Home. I like this recipe as the buttermilk helps give this cake its moistness. Some bundt cakes have a tendency to be on the dry side, but not this cake. I also like the addition of coffee to this recipe as it amps up the intensity of chocolate flavor in this cake. I’m not a coffee drinker and can assure you that there is no coffee taste in the finished product. If you’re still leery of adding coffee to the recipe, you can substitute hot water instead. I have to admit that I’m in a love/hate relationship with bundt cakes right now. Why? I love the appearance of a bundt cake. There’s something about a cake mold that really appeals to me. What I hate is the difficulty of trying to get these cakes out of the pan. There’s nothing more frustrating than having parts of the cake stick to the pan. I’ve found a couple of tips to help. 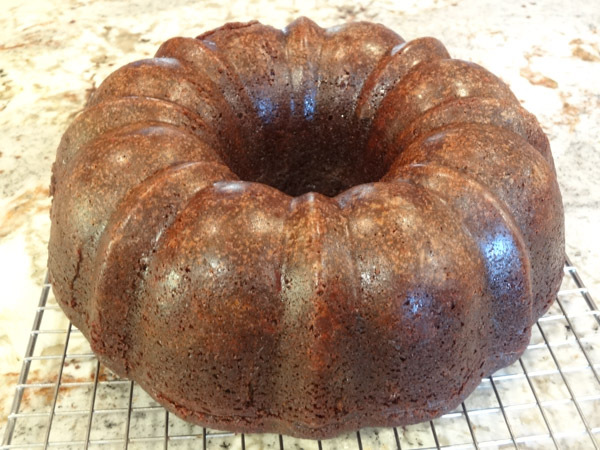 First, you have to make sure you grease every nook and groove in the bundt cake. For good measure, I’d do it again and then lightly flour the bottom of the pan. Second, I would recommend letting the cake cool completely to room temperature before attempting removal from the pan. 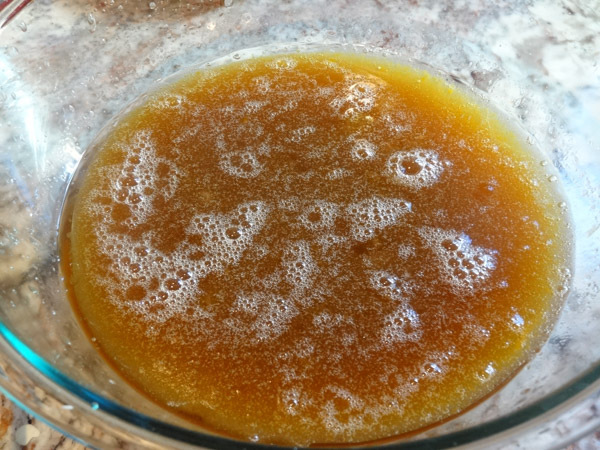 In large bowl, add in the cooled coffee, eggs, sugar, oil, and vanilla extract. Stir until combined. 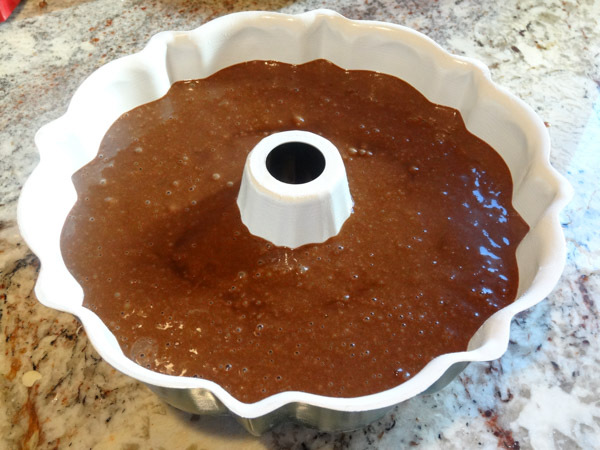 In separate bowl, add in the dry ingredients: cocoa, flour, baking soda, baking powder and salt. Slowly add dry ingredients to wet ingredients. Alternate between adding dry ingredients and buttermilk, blending on medium-low speed until all ingredients are well-combined. Batter will be on the thin side. Add in a cup of semi-sweet chocolate chips to batter and stir until combined. Pour batter into well greased and lightly floured 10 inch bundt pan. As I mentioned earlier, I made several different versions of this cake over the past month, including different types of frosting and ganache toppings. I found the semisweet chocolate ganache topping complimented this cake better than a bittersweet ganache. Heat heavy whipping cream and semisweet chocolate chips over double-boiler on medium-low heat, stirring frequently until chocolate is melted and smooth in consistency. Remove from heat and let set for at least 10 – 15 minutes. Drizzle ganache over cake. 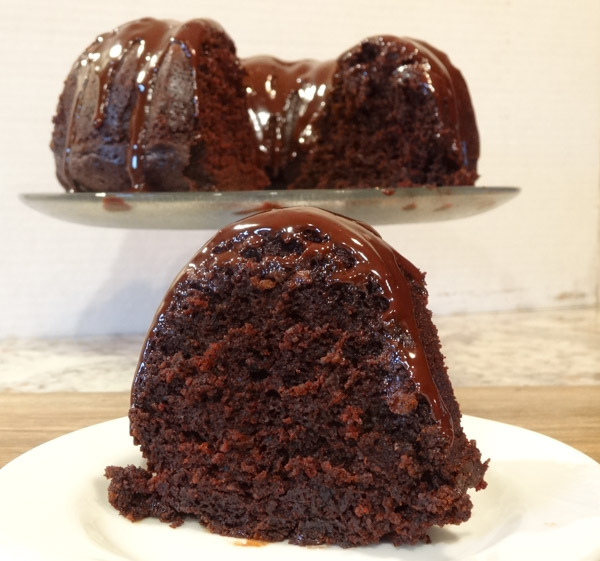 Chocolate Bundt Cake is made from scratch. A moist and intensely chocolate cake topped with a semisweet chocolate ganache. A great dessert for chocolate lovers! 2. In large bowl, add sugar, eggs, coffee, oil, and vanilla extract. Stir until combined. 3. 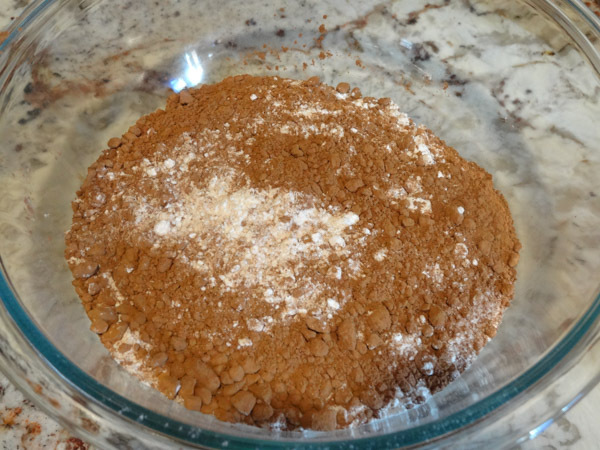 In separate large bowl, add dry ingredients: flour, cocoa, baking soda, baking powder, and salt. 4. Slowly alternate adding dry ingredients and buttermilk to wet ingredients, blending on medium-low speed until all ingredients have been incorporated. Batter will be thin. 5. Add 1 cup semisweet chocolate chips to batter. Stir. Pour batter into prepared pan. Bake for 40 to 45 minutes or until toothpick inserted into center of cake comes out mostly clean. 6. Let cool on wire rack for at least 30 minutes. Carefully run spatula along edges of pan to help loosen cake from pan. Invert cake onto wire rack. Add heavy whipping cream and semisweet chocolate chips to double-boiler. 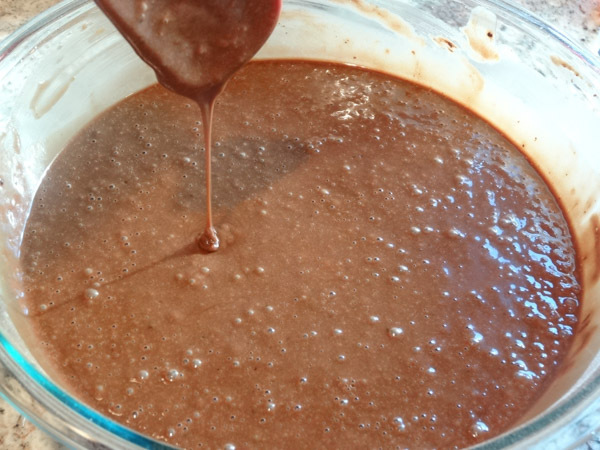 Heat over medium-low heat, stirring frequently until chocolate has melted and is smooth in consistency. 2. Remove from heat and allow to set for 10 – 15 minutes. 3. 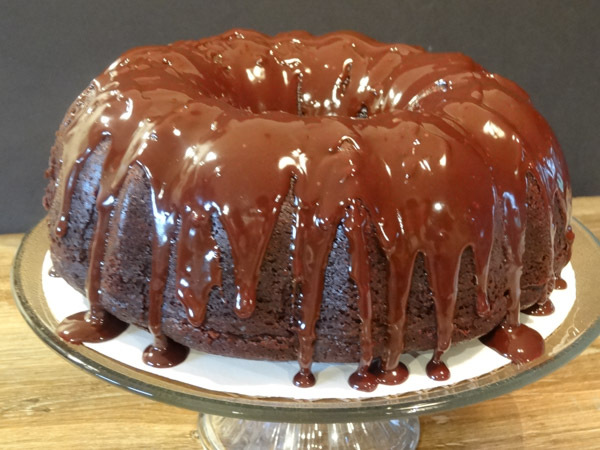 Use large spoon to drizzle ganache over cooled cake. The batter is too thin to hold chocolate chips through out the day cake so they sunk to the bottom, got stuck in the pan and destroyed the cake. If I were to make this again I’d just leave them out. Hi Alyssa, sorry the cake didn’t turn out for you. I know how frustrating it can be to have the cake get stuck in the pan. The batter is thin and the chips will settle, but I didn’t have a problem with my chips sticking to the pan. I have tried this recipe with and without the addition of the chocolate chips and it taste great either way.